So you’ve picked up a pair of drumsticks and have decided to start your own personal rhythmical journey. First of all, here at DrumRadar, we’d like to welcome you to the world and community of drummers. You might have learned a few basic beats and fills now, but you might be wondering, how else can I practice? What else can I do? Well, you’ve come to the right article. We will be discussing various drum exercises you can utilize as a beginner to help develop your chops, sense of rhythm, and technique to become a better drummer. Utilizing various exercises, you can further improve your strengths while also working on your weaknesses to improve your overall technique. So, sit back and relax as we walk you through a bunch of beginner drum exercises that will improve your playing dramatically. As with anything, you’re probably aware that you need to practice; drum practice is no exception. However, as a beginner, it’s hard to develop the proper drum practice routine, especially if you’re not aware whether or not what you’re currently doing to practice is effective. Before we dive into a deeper discussion of productive exercises that you can utilize along the entire drum set, we’ll focus just on snare drum exercises to isolate a single drum. As with any physical activities, it’s essential that you properly warm up your muscles and prepare your limbs to work together to prevent injury. 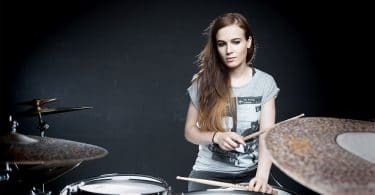 It might seem silly, but your muscles are involved, and oddly enough, you can get various muscular injuries through drumming if you’re not careful. Even if you don’t have the time to commit an hour to practice every day, that’s okay. Simply take some time at the start of your session to warm up. Based on your drumming experience, there are multiple warm-up exercises you can use, and obviously, these vary in difficulty level. Be self-aware enough to choose exercises that are appropriate for you because we want the time you spend practicing to not only improve your skills but also be fun. 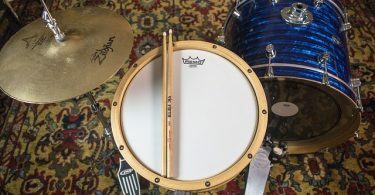 So, we’ll start with some snare drum warm-ups that you can use, or if you don’t have a set or snare drum at home, as always, we recommend that you utilize a drum pad as an effective alternative. If you’re unsure which one you should get, we recommend you stay on this page and take a quick look at our article on our favorite drum practice pads. As we’re sure you’ve already heard, an essential part of drumming is mastery and proper utilization of rudiments. They combine numerous techniques and you can further complicate them to use as complex sticking exercises and drum patterns. For the purposes of this article, we won’t be doing a full discussion on all of them, but we will focus on a few just for the purposes of coordination and technique. All of the rudiments can be utilized and practice for these purposes, but just be aware that there are more rudiments than that are mentioned here in this article. Just in case you’re thinking, “I can hear rhythms, but I don’t know how to read drum music. How can I read different rudiments to improve my playing?” While reading drum music is not an absolutely necessary skill and you can play very well without it, we do recommend that you learn, as it is extremely useful and can help you visualize different complex rhythmic patterns. If you need to, take some time before embarking on our discussion of rudiments and other exercises to read our article on reading drum music. The first rudiment is obviously the single stroke roll. No need for complex patterns here. Simply alternate your hands, right left, maintaining a consistent stroke, volume, and tempo. As a beginner, we highly recommend that you utilize a metronome while you are practicing to ensure that you are staying on tempo while being able to increase your speed. It’s pointless to be super fast if you’re not playing on time. Next is the double stroke roll. If you haven’t learned this technique yet, we need to quickly discuss the importance of finding the middle of your stick. This does not mean hold your stick literally in the middle, but rather, establishing your grip and the fulcrum where the stick bounces the most on its own. By holding your stick here, it will essentially do the work for you, but if you’re off the center, you will be fighting against the stick and where it wants to be. For the double stroke roll, each stick will bounce twice before switching to the other hand. The pattern will look like RR LL RR LL and so forth. As with the single stroke roll, it is essential that each note is being played in tempo with no major deviations in your technique. It shouldn’t feel like you’re trying to play twice as fast as a single stroke roll. Let the stick bounce with each stroke producing two equal notes. One of our favorites, the single paradiddle. If you’ve never learned about the paradiddle, you might have thought we just made up a word. No, it’s an actual rudiment, and it can greatly expand your rhythmic creativity if properly executed. The single paradiddle in a single measure looks like this: RLRR LRLL with an accent placed on the first of each four-note pairing. When you sound out paradiddle, you are performing two strokes with the same hand on the diddle. Although it may appear similar to just four normal strokes, the alternating sticking pattern can help you not only develop coordination, but it has tremendous potential for use across the entire drumset. Next is the double paradiddle. Similar to the paradiddle, it involves an accent at the start and the all-important diddle portion. However, instead of each paradiddle consisting of four strokes, it is now a total of six. The first four are normal alternating strokes with the final two consisting of the diddle. In a single measure, you will be playing two double paradiddles which will look like this. An often under-utilized rhythm, or more accurately, unfamiliar rhythm pattern for beginners is the triplet. In case you don’t know what a triplet is, it is the utilization of three notes for a single designated beat (quarter, eighth, sixteenth note, etc.) The reason we are mentioning this here, even though it is not a rudiment is because triplets force you to incorporate a higher level of coordination and timing since it is groups of an odd number. Each triplet will result in the alternation of your leading hand, and the more natural this feels, the stronger your playing can be with your nondominant hand. Obviously, there are other rudiments, and we strongly recommend that you practice all of them, as they not only help develop technique, but they help you carve your own unique drumming style. One of the most important things you can do on a drum set is develop your limb independence and coordination. If you can think it, you should hopefully one day be able to play it - that's the goal of this exercise. The concept is simple. There are 3 exercises in total. You'll play a simple 4/4 beat, and in the 1st exercise you'll focus on only changing up the hi-hat. In the next exercise you'll keep the hi-hat and bass drum consistent and work on changing up the snare hits. And in the last exercise you'll only be altering the kick drum. This lesson is much easier to learn by watching it in action, so here it is! One major difference between snare drum exercises and drum set exercises is the need to develop independence. This means that each of your limbs may be playing a different rhythm, and they need to maintain tempo and rhythm regardless of what another limb is playing. As a beginner, even when trying to learn your first beat, I’m sure you’ve been frustrated numerous times when your foot and both your hands play all at the same time. Independence, coordination, proper technique… unfortunately, these are all skills that will only be developed over time through consistent practice - so keep at it! Now, what are what are some other tips that you can use to get better? We recommend that you use sticks that are heavier than the sticks you normally use. This is using the same reasoning and logic behind professional athletes using heavier instruments, as you’re making practice harder than the actual act of playing. Develop speed and get accustomed to the heavier weights in your hands. Find sticks that have a different weight distribution from your favored sticks, so you have additional practice finding the center of different sticks and getting the feel of properly placing your fingers as the fulcrum to maximize the bounce of the sticks. Practice and warm up in the same way that you would with your preferred sticks, and once you use them again, you’ll notice a huge difference. It’ll feel effortless. Another simple tip that can help you develop further independence is switching to your non-dominant hand for beats. If you’re right-handed, use your left hand to lead on the hi-hat and your right hand for the snare drum. 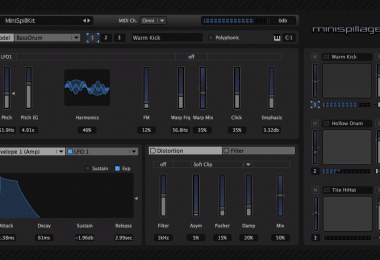 Start with the most basic beat and get increasingly complex. You’ll notice that it’s not as easy as you might have thought. In this way, you can improve your technique and ensure that you are developing consistently even technique in both your hands. As you practice all these drills and exercises with your hands, don’t forget or neglect your feet. The bass drum is a huge part of the drum set and your ability to creatively express yourself through the set. If you don’t already, get yourself a metronome. With all of the exercises presented in this article, speed is not the only goal. Start slow, and once you notice that your technique is holding steady, then you can start focusing on getting faster. If you can play super fast, but it is not on time, you’re ignoring the essential purpose of drums. As a beginner, we want you to develop good habits, as bad technique that has already been ingrained is harder to fix. There are obviously a lot of other exercises you can use, but we wanted to provide you a broader, comprehensive understanding of how to approach practice and offer you a few ideas on different drum exercises you can utilize. We’re so glad you’ve decided to start your own drumming journey, but remember, it’s exactly that, a journey. A long journey that is made up of a million steps, hours of practice, gigs, and beautiful drumming.